For the past three weeks I have said: “Self, today is the day I am going to start writing on Strategic Living”. Ha! Easier said than done! As a perfectionist, I wanted a perfect launch with a series of relevant (read interesting and useful) posts, and yet every thought, idea, and the potential topics seemed too darn fluffy and more of the same old stuff. For those of you that do not know me, I am an ordinary gal who has been on a quest to do extraordinary things. A bit on the impulsive side, I recently pulled up stakes and left Washington State to settle in my own one-acre mountain retreat in Arizona. I became engaged to my husband, Shelly, two days after meeting him on a blind date in 1974. Always willing to take risks, I became an entrepreneur in my 20s and have never looked back. In those early years, I was unspoiled by life and did not understand the consequences of self-employment. These days? Let me just say that I am a little bit spoiled by life and its ups and downs but still have that optimistic streak and feel that with some thoughtful planning, everything will come out okay in the end. Who knew how much fun this could be? Without being shackled by the constraints of deadlines, maintaining a household can be fun and something to look forward to. Funny thing about those deadlines. When you have a jam-packed day filled with must do’s, the snooze alarm becomes you best friend. And without them? You are up and at it at 6 AM – sometimes earlier. Admittedly, some days are slacker days, but for the most part, each day heralds its own accomplishment. First up? Organizing my cupboards, the garage, and the big one, my preps. Yes, I am Prepper because I don’t want to be caught being unable to take care of my needs if the stuff hits the fan. Not that it will, but it might, and might is good enough for me. Next? Revisiting cooking from scratch in a major way including new recipes and adaptations of older ones to take advantage of healthier ingredients and modern cooking techniques. Instant Pot anyone? Following that there is saving money by taking DIY to the next level. First up? A DIY mosquito repellent that really works. I know, because I have been using it for over a week and not a single bite from those pesky and annoying critters. Not to be left out is my herb garden which is already bursting with rosemary, thyme, oregano, parsley, and two type of mint. 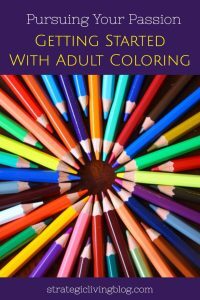 And of course, there is my addiction: adult coloring. I spend an hour of so at the end of the day unwinding with one of my many coloring books. Old habits die hard, so in my usual style, I will share some final thoughts. My wish is that Strategic Living becomes the story of us. It is about happiness, wellness, and the comforts brought on by being able to get up each morning to embrace the day with gusto. At least for now, will take the form of an old-style blog, meaning a journal of random goodness with no set schedule. Think serendipity. Thank you for joining me in this quest. If you like what you see or are just plain curious, join my small but mighty email list by clicking here. You just never know where Strategic Living with take you! You were the reason I signed up for Backdoor Survival in the first place, so I thank You for not going away. Glad to see you have gotten started with your new direction. Sometime4s, the first step is the hardest! Keep it up! Glad you started. I was not enjoying my ‘Gaye deprivation disorder’. Looking forward to enjoying, and learning as we progress down our new path. Thanks, Deb. Next up is my DIY mosquito repellent. Today, tomorrow, or whenever I feel like it. This is freedom! Honestly, though, I better get it posted sooner rather than later because those little buggers are out there this time of year. You’re a writer so you know the mantra: just WRITE, damn it. Communicating is strategic. We can fine-tune together as you go. It’s about the journey, the small victories, and sharing epiphanies. You, unlike some others who shall remain unnamed, understand community. We’re your community, but without you, the compass doesn’t point to true North. So far this week I’ve planted two rose bushes, a dwarf lime tree, and a Reed avocado tree. I’m on the lookout for new coffee plants to replace the ones that died during our unexpected rainy season earlier in the year. (If they get big enough, the plants are supposed to grow into a great hedge as well as produce “cherries” that can, eventually, be roasted to make coffee . The best coffee I’ve ever had was from beans I roasted myself. Messy but worthwhile. ) I’m experimenting with replacing margarine with avocado oil. I still need to get my preps inventoried and augmented. The most important strategic thing in my life right now is preps for retirement in the next few months. I’ve decided my employer no longer deserves me and I’m in a position to say adios. I hear you about incorporating new scheduling into the daily routine. I can get up and start the day when my husband leaves for work, or I can sleep in and decide what needs to be done from there. Everything is new again, and it’s a good feeling. Now if I can just get my quilting room under control, I will be a happy late-middle-ager. I commend to your attention Ruth Goodman’s book “How To Be A Victorian” as well as the entire series of “farm” DVDs from the BBC. Although they’re Region 2, and thus not playable on American DVD players, I’ve had no trouble with playing them on my computer’s DVD drive. The book and DVDs have led to me realize an EMP event will set us back much farther than a hundred years, but that, even so, we will survive and flourish, once we adjust. Just my two cents. Welcome back, Gaye. You’ve been missed. It is truly novel to wake up with no deadlines other than those that are self-imposed. I do hope you ditch the margarine. Health-wise, you can do better IMO. By the way, Ruth Goodman’s book was available as a download from our local library and I just snagged it – thanks for the tip and for finding me here on Strategic Living! Hmm… one guy out of six and now I make two. Reckon this ain’t going to be about skinning squirrels, or guns and ammo or the best pocket knife to carry? Just kidding. I’ll sign up. Ha ha ha. Shelly is getting himself set up with archery. Does that count? As John R. said over on my FB page, the 7-foot elk (nicknamed “Moose”) in our back yard represents living, walking Food Storage. Just in case, of course. Glad to hear from you. Right now I am getting ready to head South to help DIL with our newest Grand child when she has back surgery. Laundry room is done and DH planted flowers and then some tomato plants, I thought we were not going to get some things in this year due to all the work being done on the property. A request if I may, I learned my 3 month old grand nephew has been diagnosed with a rare genetic disease , Osteopetrosis, and would like to ask for prayers for him and my niece. They are in Children’s Hospital in Boston for the next few months while he gets treated. Treatment (not cure) is bone marrow donations. Thank you for your support. You got it. Sending all of the positive energy I can muster to you and your grand nephew. I hope he is on the mend soon. I got GREAT news this am. Donna – Funny you should ask. I miss walking out my door and being steps away from the harbor and the surrounding trails. Here we need to get into the car to reach a trailhead and it is so very easy to find an excuse not to go. Life is going to be a lot easier when our home/house/cabin remodel is done! Your life sounds blissful. Keep it up! We’re here waiting and listening…. Awwwww. BTW, Robin, I love my Instant Pot. Did you get one yet? It is the easiest method on the planet for cooking grains and pinto beans. Separately, not together. There you are ! 🙂 I’ve missed you and your encouragement. Hope your hiatus was refreshing. I’m looking forward to hearing about your organizing, your experiments and your new life in Arizona. I’ve also been considering an Instant Pot. How do you think it would work for a single person? It’ll be interesting to see how you transition from the sea to the mountains. I’m intrigued. May the best of fortunes be with you and yours. Oh my gosh!! Thanks George Ure for guiding us to our girl!! Will be here everyday just as I was from the beginning of your old site…..whew…..I feel so much better now!! Prayers and best wishes to your grand nephew and the family. Hope you have a safe trip and so happy you are back.